Streamlined regulations are needed to pave the way for homeowners interested in building in-law/secondary units on their property around five Berkeley, Oakland and El Cerrito BART stations and in nearby flatlands, according to a University of California, Berkeley, feasibility study. 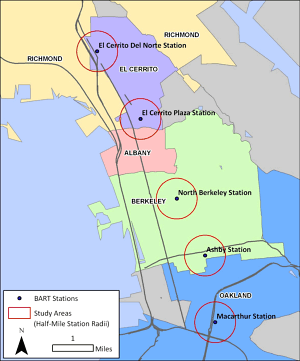 The map above shows the study area, which included five Bay Area Rapid Transit (BART) stations and portions of five separate incorporated cities. The study, just released by the Center for Community Innovation at UC Berkeley’s Institute of Urban and Regional Development, examined in-law unit opportunities in light of projections that the San Francisco Bay Area population will grow by 2 million people by 2035. This estimate adds to the steady pressure for infill and affordable housing that stems from California’s Sustainable Communities and Climate Protection Act of 2008 (Senate Bill 375). In-law units could accommodate a small, but significant, share of the region’s expected population growth, while providing affordable housing and boosting the local economy, according to Karen Chapple, an associate professor of city and regional planning. She is lead author of the $60,000 study funded by the University of California Transportation Center. “We can’t build them yet, but we should build them, and we must build them,” said Chapple, who last winter built a prototype sustainable cottage in her own West Berkeley backyard. Approximately 30 percent of the homeowners living in single-family residences in the study area said they might be interested in building secondary units – typically one-bedroom or studio units – if conditions were right. But despite several new state laws enacted as recently as 2003 to support secondary unit housing, researchers found that only about one of five of the single family residential parcels in the study area could accommodate a detached secondary backyard unit under current zoning regulations. 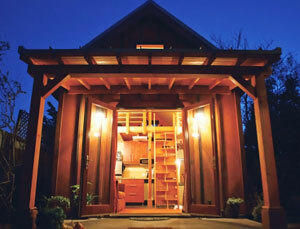 Karen Chapple, lead author of the study, built her own prototype sustainable backyard cottage last winter. Researchers said the most serious barrier to such infill projects are local planning rules, so they proposed adjusting off-street parking requirements, encouraging car sharing, declaring amnesty for existing in-law units without proper permits, and establishing a local loan fund for secondary units. Parking, generally the big bugaboo for infill projects, may be less of an issue with secondary units, as their inhabitants are less likely than other residents to own a car, the researchers found. With these regulation changes, looking just at the BART station areas studied, Berkeley could see an 86 percent in in-fill housing, up to nearly 2,000 units, while El Cerrito’s share could skyrocket by 313 percent to just over 1,000, and North Oakland could see a jump of 892 percent, or 516 new backyard homes. By extending the proposed changes into the flatland areas, Berkeley could see up to 6,040 in-law units while El Cerrito’s share could climb to 2,001 and North Oakland 2,289, according to the study. Chapple and her team estimate that building the maximum number of secondary units could increase economic activity by $65 million in El Cerrito, $75 million in North Oakland and $197 million in Berkeley – and produce 3,200 jobs between the three cities. Easing regulations would also help meet regional goals for housing affordability and smart growth, the study said. At the Association of Bay Area Governments in Oakland, research director Paul Fassinger said that more secondary units would make a major contribution to solving the region’s housing problem and provide critical expansion of the number of affordable housing units.